Rude Boi Ent is bringing you another installation of T2T…. Fab Lounge (1805 Connecticut Ave NW DC)! AJ of Rude Boi will also be celebrating her birthday!!! $5 Cover and $5 Drink specials ALL NIGHT!! 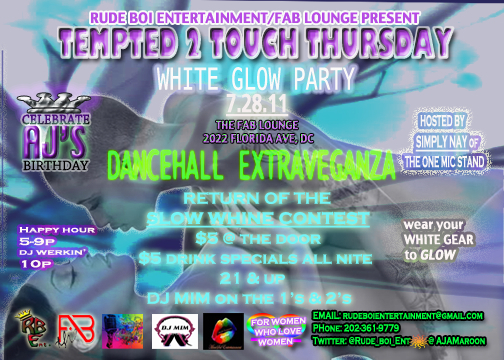 DC’s own DJ MIM will be burning up the 1s & 2s spinning reggae ALL NIGHT! Hosted by Simply Nay of The One Mic Stand Show on the mic ALL NIGHT! FOR ALL OF YOU WHO MISSED OUT IN MAY, DON’T MISS OUT AGAIN…GRAND PRIZE!!! WEAR THAT WHITE GEAR TO GLOW, BABY! This entry was posted in DJ MIM, Events and tagged Fab Lounge, GLOW Party, lesbian, One Mic Stand, Rude Boi Entertainment, Simply Nay, Tempted To Touch, washington dc by MIM Entertainment. Bookmark the permalink.